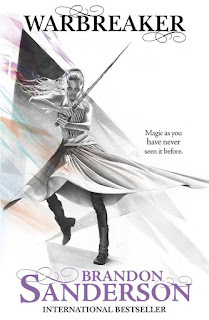 Synopsis: Warbreaker is a standalone high-fantasy novel and is set in a world called Nalthis. In this world there is a complex system of magic known as the BioChroma and certain individuals will sometimes come back from the dead ("The Returned"). There are also two nations in this world called Idris and Hallandran which were once part of the same kingdom and now clash with each other over almost everything - religion, politics, aesthetics, territory, lifestyle, and the use of magic. As the tension between these nations is steadily increasing, the King of Idris has arranged for his eldest daughter Vivenna to one day marry the God-King of Hallandran (a powerful Returned) so that she can provide him with a divine heir. To prepare her for this, Vivenna has been extensively tutored in politics and diplomacy since childhood. However, much to everyone's astonishment, the king changes his mind at the very last minute and decides to send Vivenna's younger, tomboyish sister Siri away instead. Siri is completely unprepared for her new life in Hallandran with its imposing palaces, disdainful priests, and her new husband who seems to be ignoring her (and whom Siri isn't even supposed to speak to or touch outside of the bedchamber). At the same time, Vivenna, who is usually very calm and composed, is so outraged to have had her purpose in life snatched away from her that she then secretly travels to Hallandran and begins to work with a small band of mercenaries and rebels with the aim of rescuing her sister. But both princesses then discover that all is not as it seems. Siri soon realises that her new husband Susebron isn't at all the cold, cruel tyrant that she thought he was but is instead a very shy and sweet mute who is nothing more than a figurehead. Siri secretly begins to teach Susebron to communicate with her and the two of them rapidly fall in love. However, Siri is also beginning to suspect that his priests are plotting to assassinate them both. And Vivenna then makes the horrifying discovery that her actions may have set the wheels in motion for a war that could tear both Hallandran and Idris apart. Desperate to put everything right again she then teams up with a mysterious man called Vasher who has a powerful, sentient weapon. Meanwhile, an unconventional and cynical Returned god called Lightsong finds himself becoming increasingly disturbed by the changing political dynamics in the gods' court. Almost in spite of himself he then takes it upon himself to befriend Siri and to investigate a mysterious murder that the priests seem to be hushing up. Warbreaker was a great read! It contained everything that I've come to expect from a Brandon Sanderson story... a gripping plot with unexpected twists, humorous dialogue, terrific world-building, a unique and detailed magic system, the themes of faith and identity, highly engaging and likeable main characters (especially Lightsong who was my favourite! ), and plenty of political intrigue, mystery, action and suspense. I also appreciated how colourful and tropical the setting of Hallandran was as it made for a very nice and interesting contrast to the world of Scadriel in The Mistborn books. The only reason why I haven't given this book a five star rating is because I was somewhat disappointed with its ending, as it was very rushed and the sequel for this book that Sanderson eventually plans to write (Nightblood) is set up in rather an awkward way. Having said that I still really enjoyed this book and I do hope that Sanderson will eventually get around to writing its sequel as its characters and world definitely deserves another story.